In addition to copious amounts of sunshine and warm desert air, both upscale and antique shopping, excellent golf courses, great restaurants, cultural events, performing arts, and old west attractions are all located in North Central Phoenix. 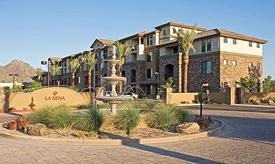 What more could you ask for when choosing a Phoenix retirement community? La Siena is built on the 6.2-acre site of the old Phoenix landmark-Bud Brown's Barn. Established in 1947, Bud Brownâ€™s Barn offered an authentic Western venue for private parties and events and was known for its Western hospitality, live music, hayrides, and steak dinners. The Barn also featured a treasure trove of antiques from around the country. A fun history for a new retirement community that is all about fun. How fitting!